Photographing weddings in the Lake District is great but throughout the year we head to Sheffield to photograph weddings, we headed to Mosborough Hall in Sheffield for Alex & Gary’s big day, it was a beautiful sunny Saturday for their wedding. As childhood sweethearts who met as toddlers this wedding was clearly meant to be! Alex looked amazing in her gown – all the bridesmaids were so excited to see her all dressed up – their was a few tears too! I love her bouquet from Fantail Florist in Sheffield – beautiful colours. Gary and the groomsmen arrived in style in a limo while Alex and her Dad sneaked off in the limo too for a little drive before the ceremony. Gary was a bit overwhelmed when he saw Alex walking up the aisle – there were a few tears there too and lots of laughter from the guests about the best man duties! After the ceremony guests headed outside for champagne and some photographs in the sunshine. Alex was so happy to be surprised with a visit from their beloved dog Frank who looked very dapper in his bow tie! After some enthusiastic confetti throwing we headed inside where the reception room was filled with candles and the most stunning looking wedding cake. The speeches were hilarious with some embarrassing stories shared about poor Gary! In the evening there was plenty of dancing and the room was filled with happiness. We wish you both much love, laughter and happiness for the future – it was a pleasure to photograph your wedding! 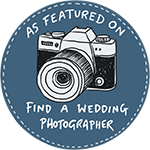 Paul & Helen are Lake District wedding photographers based in Fletchertown covering Carlisle weddings and weddings in Keswick & Cockermouth too. They also photograph weddings in Sheffield and the Peak District too and the North of the UK!